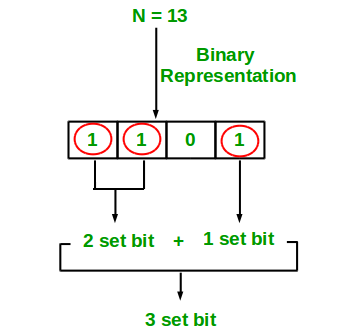 Write an efficient program to count number of 1s in binary representation of an integer. 1. Simple Method Loop through all bits in an integer, check if a bit is set and if it is then increment the set bit count. See below program. // This code is contributed by Anshika Goyal. // This code is contributed by Raj. // This code is contributed by m_kit. Subtraction of 1 from a number toggles all the bits (from right to left) till the rightmost set bit(including the rightmost set bit). So if we subtract a number by 1 and do bitwise & with itself (n & (n-1)), we unset the rightmost set bit. If we do n & (n-1) in a loop and count the no of times loop executes we get the set bit count. The beauty of this solution is the number of times it loops is equal to the number of set bits in a given integer. Since n = 0, return count which is 2 now. // This code is contributed by ajit. 3. Using Lookup table: We can count bits in O(1) time using lookup table. Please see http://graphics.stanford.edu/~seander/bithacks.html#CountBitsSetTable for details. Note: In GCC, we can directly count set bits using __builtin_popcount(). So we can avoid a separate function for counting set bits. 4. Mapping numbers with the bit. It simply maintains a Map(or array) of numbers to bits for a nibble. A Nibble contains 4bits. So we need an array up to 15. Now we just need to get nibbles of given long/int/word etc recuresively. // count set bits in nibbles. # count set bits in nibbles. // pre-storing count set bits in nibbles. Storage Complexity: O(1) Whether given number is short, int, long or long long we require array of 16 size only which is constant. How to swap two bits in a given integer?